Thank you also to you, my magnificent reader, for taking some time to drop by. 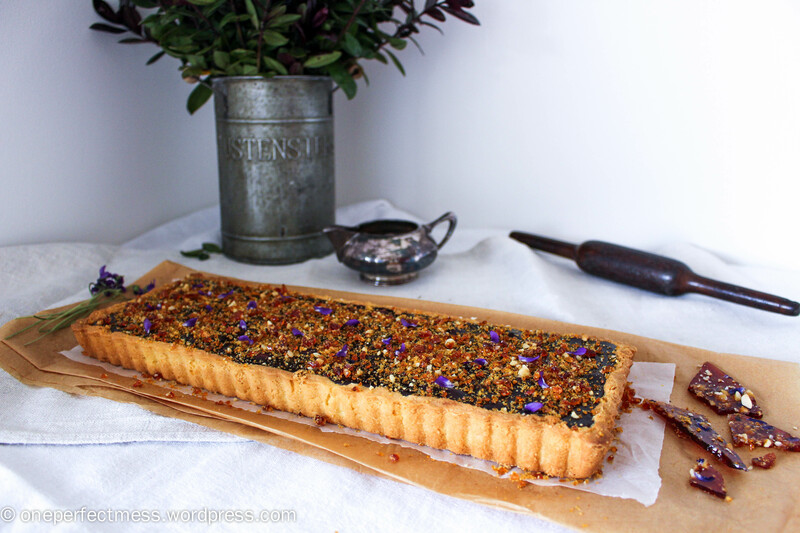 I get all fuzzy inside every time I receive another view, like, comment, follower etc., and it makes my day when I’m sent photos of goodies baked from this blog. I hope you enjoy this next little number! I put it together for a very kind-hearted, adventurous and all round lovely friend. She’s very special to me, so deserved something extra pretty for her birthday! 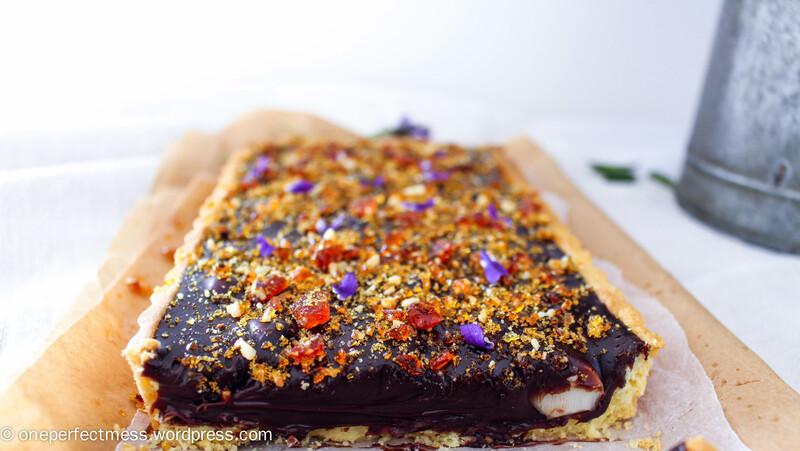 She alluded to liking ‘honey, dark chocolate and violets’, so voila; a buttery tart shell filled with rich dark chocolate ganache and crunchy macadamias, bedazzled with sparkling macadamia and violet praline. Wickedly rich and just a tad tempting…enjoy! Press the dough directly into a buttered tart tin, and cut off any overhanging remnants with a butter knife. Prick all over with a fork and press greased aluminium foil tightly against the dough before filling with rice, dried beans, or tart weights. Freeze for at least 30 minutes, or until very firm. Preheat the oven to 170°C/340°F fan-forced, and bake the tart shell from frozen on a centred rack for 20 minutes. Remove the foil and weights and, if the base of the shell has puffed up, press it down gently with the back of a spoon. Bake for another 8 minutes until just golden brown. Remove the shell from the oven and leave to cool completely in the tin. Leave the oven on for the praline macadamia nuts. Once the tart shell has cooled, sprinkle the nuts evenly over the base. Bring cream just to a boil over medium heat, stirring frequently to ensure it doesn’t burn on the bottom of the pan. Place chopped chocolate, honey and salt in a large, shallow bowl. Pour the hot cream evenly over the chocolate, and cover tightly with foil. Leave for 3 minutes, then whisk vigorously until smooth. Leave the ganache to cool for 20 minutes until slightly thickened, then transfer to a jug and pour slowly and evenly into the tart shells. Don’t pour too quickly, or all the nuts will start swimming! 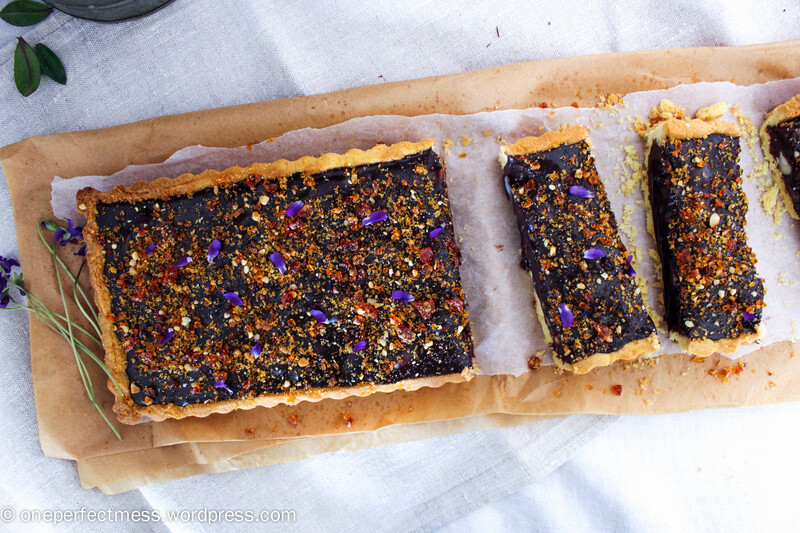 Refrigerate the tart until set, for 1-2 hours or overnight. Toast macadamias on a lined tray for 7 minutes until golden and aromatic. Roughly chop and scatter evenly over a lined tray to form a rectangle, about 15 x 20 cm. Simmer sugar and water over low heat, stirring occasionally, until sugar has dissolved. Use a pastry brush dipped in water to wet the sides of the pan as the sugar cooks, to prevent any sugar from crystallising. Turn the heat up to medium so that the mixture boils gently. Boil for 10-15 minutes without stirring, until the praline turns a deep golden colour. Keep a close eye on it, as it will go from golden to black very quickly! When it reaches a deep golden colour, remove the praline from the heat and wait a minute for it to stop bubbling rapidly. It will continue to cook slightly at this stage, so don’t remove it from the heat too late. Very slowly drizzle the hot praline over the macadamia nuts, making sure you fill in any gaps to form an even, solid sheet of toffee. Be careful to not touch the praline, as it will burn like crazy! 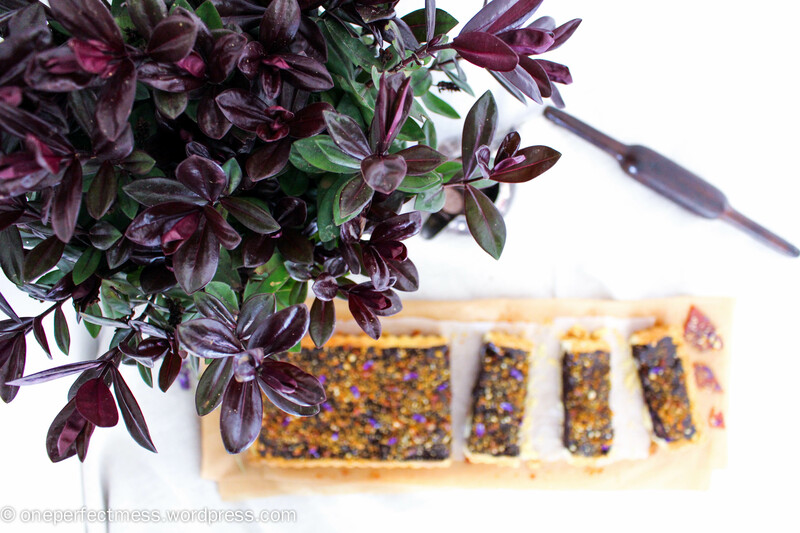 Working quickly, evenly sprinkle the violet petals over the praline before it sets. Leave some fresh petals aside for final decoration. Leave to cool completely, then pulverise the praline in a food processor or with the handle of a large knife. You can make the pieces as chunky or fine as you like. Quickly store the praline in an airtight container until ready to use. 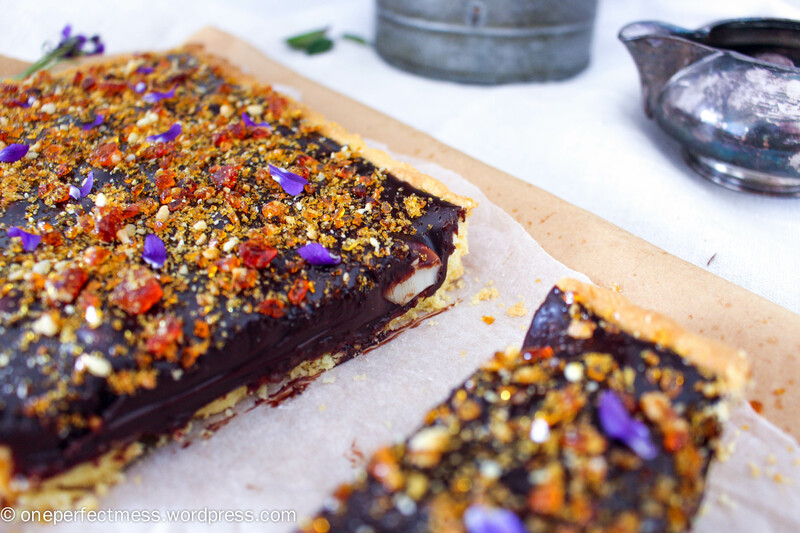 Remove the tart from the fridge 30-60 minutes before serving. 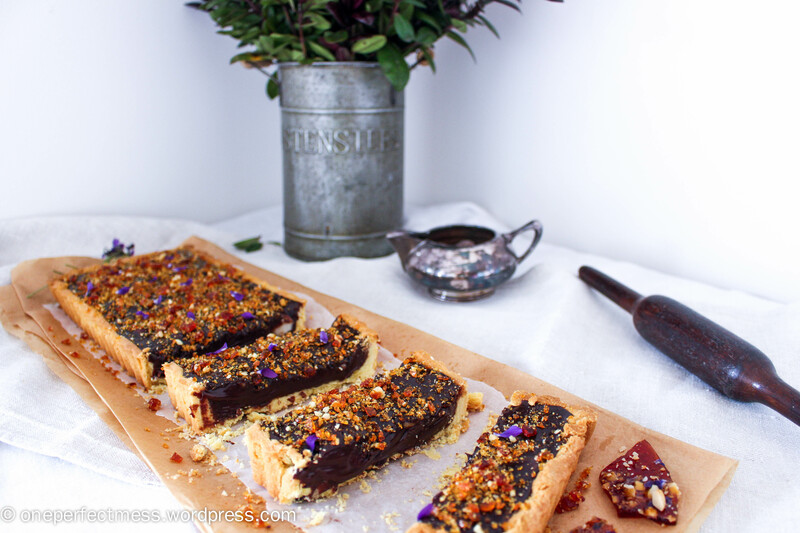 When the ganache has softened slightly, and immediately prior to serving, sprinkle generously with praline and some fresh violet petals. Slice with a sharp, non-serrated knife, and enjoy! Store the unbaked tart shell covered and frozen for up to 2 months. Store the praline in an airtight container for up to 5 days. 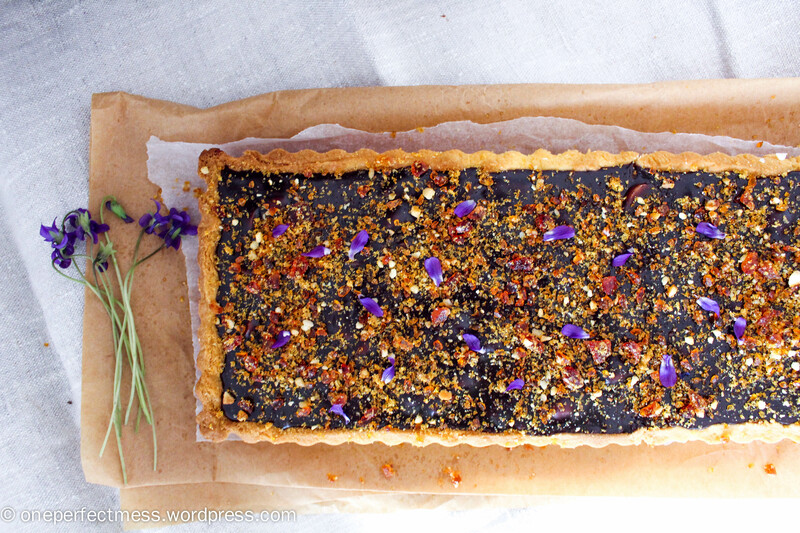 Store the tart covered and refrigerated for up to 5 days, but don’t sprinkle with praline until ready to serve.